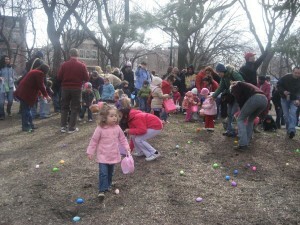 The arrival of Spring is greeted in our neighborhood by many religious ceremonies, Passover and Easter being the most prominent, but my favorite is the annual Holstein Park Egg Hunt, which marks the return of bedlam to Bucktown. The sight of 150 pre-school kids swarming across the dirt mounds of Senior Citizens Park is a harbinger of warmer days ahead––of T-ball tournaments, amoeba soccer games and a hundred heads bobbing in the Holstein pool. Months of pent up energy, wasted on TV watching in days too cold to go out, explode in outdoor activity. And I’m not talking about the kids. I’m talking about the parents, coming out of winter hibernation for the first time to greet the neighbors and relearn the names of the other kids on the block. The simplicity of holding an egg hunt should not be underestimated. Eggs are hidden and eggs are found. If you run out of eggs, the finder becomes a hider and you go all over again. Parents take pictures. Clothes get dirty. 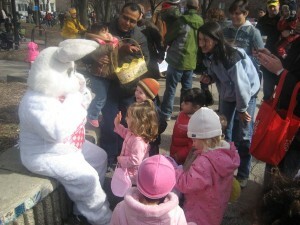 If the Park District smiles on you, you get the bunny costume for endless photo opportunities. I know there are some who think the community would be better served by an organized event. If everyone would just sign up in advance, form lines and follow instructions, we would never run out of eggs and all the children would have an equal chance to enjoy the day. As long as we’ve been doing this, however, I’ve never heard a kid complain and I’m always amazed how satisfied parents are just to get the family out and about on the first nice day of the year. The time and date for the event, as well as the rules, are distributed in a monthly email called “Holstein Happenings.” That alone is usually enough to guarantee a good turnout. 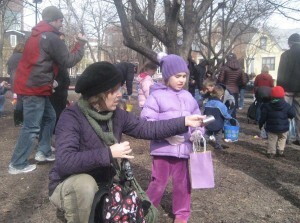 This year, however, the Sun-Times picked up on it and listed Holstein first among a dozen free egg hunts last Saturday, so the crowd was bigger than ever. The beauty of an egg hunt is that most of the kids don’t know what they are celebrating. They come to chase their friends, dig in the dirt and get their picture taken. If they timidly hold back at the starting line, parents will gently prod them to show courage and move forward. If they gather too many eggs, that becomes a teaching moment about sharing. 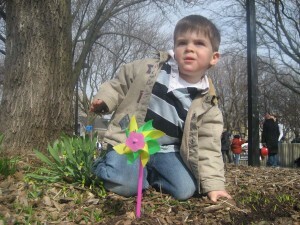 From a kid perspective, think about it, what is the point of an egg hunt? Scattered out on the lawn are a bunch of multi-colored plastic ovals you are supposed to pick up before someone else does. Some are said to contain candy, but half the kids don’t know yet what candy is. There are no prizes for collecting too many, or too few, or gold, silver and bronze ones. Your only reward is getting your picture taken with a rabbit costume that looks like it was locked in a closet at Chuckie Cheese for the last year. And yet, everyone leaves happy. Because at that age, any time you can spend with your parents is better than time without.